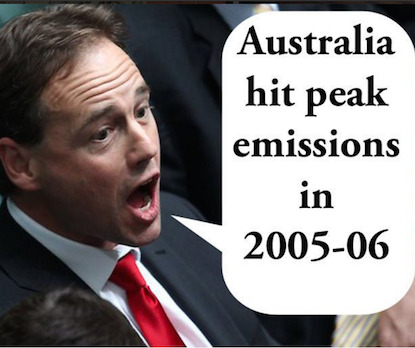 Tricky Turnbull's climate strategy: When less is more! Turnbull promises to be trickier than Howard as he tries to put one over the public with his "less is more" climate strategy! RenewEconomy's Giles Parkinson does his own FactCheck. THE COALITION government under Malcolm Turnbull has a rapidly evolving strategy on climate change and clean energy — announce new jobs and investments, but only after cutting even more jobs and investments. Those were the allegations levelled at the Turnbull government on Tuesday after the CSIRO announced a new climate change research centre in what appears to be a patch-up job by innovation minister Christopher Pyne and environment minister Greg Hunt, and Hunt’s announcement of an “extra” $50 million for the Great Barrier Reef. The CSIRO cuts are particularly galling for the science community. A new division to be based in Hobart, combining with elements of the Bureau of Meteorology, will employ 40 climate scientists. But CSIRO chief Larry Marshall, intent on converting the CSIRO from focusing on the public good to revenue opportunities with business, says 75 jobs will still be lost from the climate division, albeit down from 110. Similarly, Hunt on Tuesday announced $50 million of “new” funding for the Great Barrier Reef, which the government has finally realised is under grave threat following the worst bleaching event on record, which has touched more than 90 per cent of the reef. The Greens said: Not so fast, arguing that the funds simply replace monies cut in the past two years — $40 million from the Reef Water Quality Program in 2014, and $10 million from the Great Barrier Reef Marine Park Authority and the Australian Institute of Marine Science. The recycled funding follows a similar pattern on clean energy. Hunt has used the proposed start of construction on a wind farm in northern NSW as proof that the government has brought clarity and stability to the industry. Instead, the Coalition’s policies have brought the industry to a standstill. And last month, when the Turnbull government announced the creation of a “new” Clean Energy Innovation Fund, it did so only after shifting funds already allocated to the Clean Energy Finance Corporation, and announcing it would seek to rescind the $1.3 billion budget legislated for the Australian Renewable Energy Agency. On climate, numbers are juggled in a different way. Hunt insists that Australia is on track to deliver its Kyoto target for 2020, which is true, because it is largely a book-keeping exercise borne out of a highly favourable agreement for Australia reached a decade ago. The climate target that really matters – the one signed in New York last Friday under the Paris agreement – is more problematic. Australia’s target is well short of what is considered its fair share by every assessment bar the Coalition’s, which continues to rely on a “per capita” reduction calculation that places Australia at the bottom of the world ladder, along with the oil-guzzling Saudis. Australia’s own data actually shows an increase in emissions in the coming decade, bar some as-yet unannounced policy measure. And while the Coalition may be relying on another fortunate piece of accounting, the Paris deal calls for the “decarbonisation” of the global economy. That means replacing fossil fuels with clean energy. There is now a growing view that the cross-over point between the fossil fuel era and the debarbonised era may occur in the next five years. This will coincide with further falls in the cost of solar, and a growing contribution to the world’s energy mix, and a big slump in the costs of battery storage, which will not only facilitate more renewables, both at grid level and “behind the meter” in households and businesses, but make electric vehicles something of a no-brainer for consumers. They were ignoring the exponential growth — just as they ignored the exponential growth of the internet and human genome project. Half a per cent is only 8 doublings away from 100%. “Now, four years later solar has doubled twice again. Now solar panels produce 2 per cent of the world’s energy, right on schedule. People dismiss it saying ‘2 per cent is nice, but a fringe player. That ignores the exponential growth, which means it is only 6 doublings or 12 years from 100 per cent. Saudi Arabia has repeated its focus on looking at a world beyond fossil fuels. The collapse in the oil price is estimated to cost Gulf states $500 billion in lost revenue in 2016, leaving them with budgets barely capable of affording the massive subsidies paid to fossil fuels. And U.S. defence major Lockheed Martin has announced its intention to go into the battery storage industry — this, as the French and India governments confirmed their pact to encourage $1 trillion in new investment in the solar industry under the International Solar Agreement first unveiled in Paris. These examples barely scratch the surface of what’s going on around the world. It leaves the Australian economy, which continues to focus on commodities and to prostrate itself at the feet of the fossil fuel industry, with a clouded future. The government, you would hope, is smart enough to see what is coming. It just doesn’t have the fortitude to share that view with the public, or tell the hard right ideologues to stop kidding themselves. This article was originally published in RenewEconomy on 26 April 2016 and has been republished with permission. You can follow Giles on Twitter @GilesParkinson.